you realise that you’ve dropped a stitch – ack! – or you’ve added extra stitches – where did those come from? – or maybe your knitting’s awesome except that it’s so tight you practically sprain a muscle trying to get your needle into the stitches. As frightening as these scenarios are, you are not alone! Knitters from time immemorial and knitters to come have and will be making these same mistakes. So when you encounter them, don’t freak out. It’s all part of the natural course of things. So, let’s take a closer look at these common beginner bugaboos and ways to fix them. When you’re first starting out as a knitter, you’re excited, nervous and kind of happy! Knitting is fun, after all! But sometimes the nervous side takes over and you start gripping your needles and pulling at your yarn. You’re scared your stitches will fall off. But the problem is that your knitting is so tight you can barely get your needles into the stitches. You’re going to pull a muscle if you don’t take it easy! So, herewith, three ways to loosen up your tight knitting! Panic Level: DON’T PANIC. The best way to prevent these three beginner mistakes is to frequently admire your work. It’s not narcissistic. It’s just good knitting sense! If something looks funky, stop and investigate. Did you accidentally do a yarn over? Are you knitting on the tips of your needles? Like weird skin rashes, ignoring knitting problems rarely makes it go away. So, be vigilant! And when you need to rip back your work, take a deep breath and rip, rip, rip. Lastly, don’t even think about getting upset when you make a mistake. The person who never made a mistake never made anything. So make mistakes! It means you’re creating, and that’s a heckuva lot better than doing nothing. Okay! 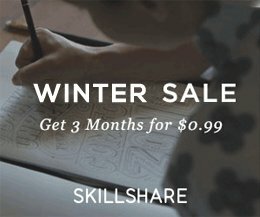 If you’re a new knitter, I hope you’re getting the hang of it! 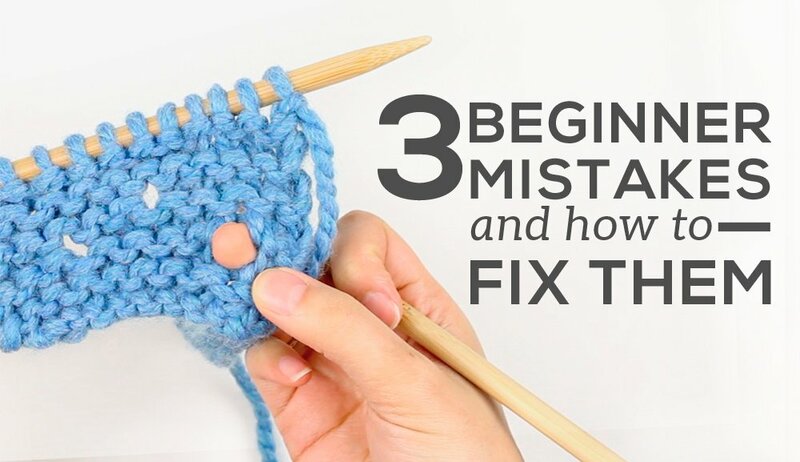 Let me know if you encounter any of these three knitting mistakes, and if there are others that I haven’t covered, leave ’em in the comments! I just ripped my work to zero because I couldn’t figure out where I added an extra stitch!!! It’s not that I didn’t look. But I couldn’t see it. And it wasn’t a yarn over :'[ So back to cast on. Hey Virginia! Glad I can help! The thing with mistakes is that if you make them enough, you’ll eventually be able to spot them a mile away – and fix them really easily! Hi! Thanks a lot for this. I am a total beginner, and have started working on a muffler for my first project. Unfortunately, I have missed a stitch and don’t know where or how to locate it. The video you’ve posted here is not viewable to me as video content is blocked at my university. Please help if you can. Hi April, Yikes! It’ll be hard to illustrate how to pick up a missed stitch without being able to view the video! Is YouTube completely blocked at your university? 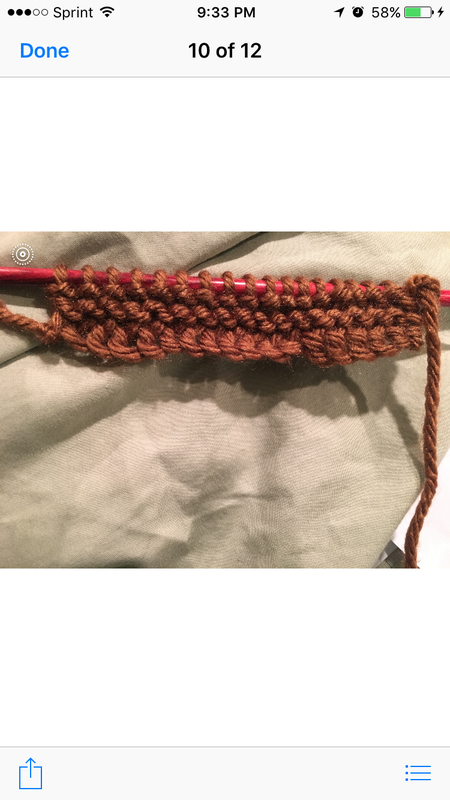 Hello – I am making a slouchy hat and when I was doing the increase round I counted two extra stitches. I should only have 60 stitches. The two extra are at the beginning of what will be knit rounds. Should I knit these two together or take them off ? Thanks for your help. If you’re not to far into your knitting, I would just rip out the stitches and try the increase round again. Once you increase to 60 sts, stop increasing. Don’t add in any more stitches since 60 is exactly what you need. Hope that helps! I’m making a slouchy hat with a 16 row lace pattern within it, so there’s lotsa holes and yarnovers and s2kp. This last round I was one stitch short. I must have dropped a stitch, but I can’t find it. Hey Fancy, Holes, yarnovers and S2KPs, oh my! You’re in Lace Country! To be honest, I’m not sure how to help you find your dropped stitch since I can’t see your knitting or your pattern. The good news is that since you’re knitting lace, it’s unlikely anyone will notice that a stitch was dropped. I’m wary of telling you to add in an extra stitch by doing an MI because it may throw off your lace pattern entirely. Lace is tricky! That’s why many lace knitters will incorporate what are called “lifelines” every few repeats. This involves using a scrap piece of yarn (or sometimes dental floss for its smoothness) and weaving it into a row of your stitches. These basically “hold” the stitches so that if you make a mistake later on, you can rip back your work to your lifeline and pick up those stitches rather than ripping back all the way to the beginning (horror!). Just remember to mark down the row where you placed your most recent lifeline so you know where to start your knitting should you need to rip back to that lifeline. So, going forward, I would suggest using lifelines in your lace knitting until you feel super comfortable with the lace pattern. Hope this helps! And best of luck navigating Lace Country! Knitting a dishcloth “Truly Tectured” and all pulls were on the right side. Now I come back to it and the purls are on the wrong side. Can’t figure out what I am doing wrong. Hey Suzanne, maybe you purled on the on the wrong row? That’s my best guess! You might want to rip back to the place where the knitting looks OK and then take it from there, provided that you can find your place in the pattern again! Hello, Davina. As a complete beginner, the clear demonstrations in your videos helped me fix a little mistake in my first project while panicking and helped me loosen up my knitting. I cannot thank you enough, honestly! That’s awesome! Glad I could help you out of your knitting snafu. I totally relate to the panic! Hi Davina, how are you. Hey Vanessa! My advice would be to be really careful about each stitch you knit! Before you start a new row, make sure you’re starting with the right number of stitches. Then, make sure that the stitches that you knit are actually stitches and not an area *between* your stitches. Hope that helps! Thanks so much for the tip about tight knitting! I am a beginner knitter and I’m using 5mm steel needles with super tight stitches. So I really appreciate the advice that I should try out some bamboo needles and thicker yarn. I’m excited to test that out and see if it helps. Thanks! Thanks Jheri! Glad I can help. 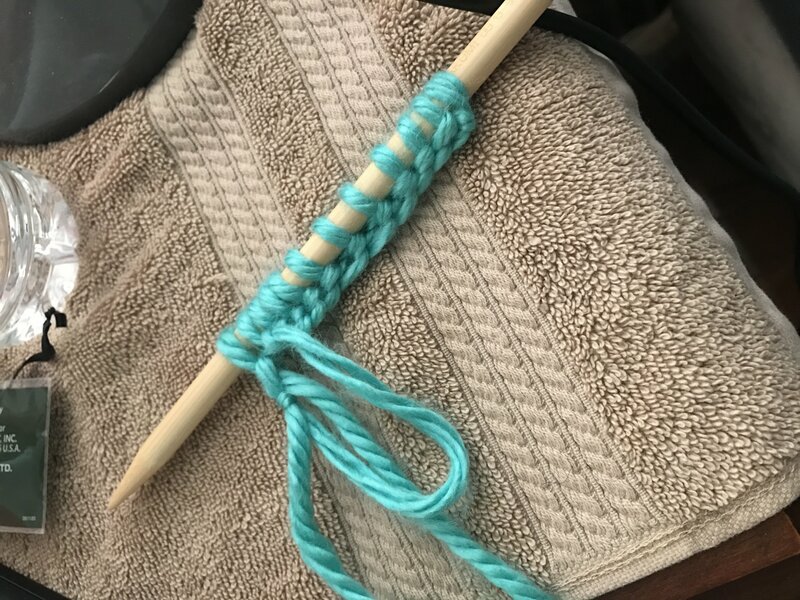 As your hands get used to knitting and learn the “language” of knitting, they will naturally relax and grip the needles less tightly, resulting in less tight stitches. Good luck! Thank you so much for posting these videos of what can, what might and what WILL happen. I am experiencing all the above (lol). I spend more time ripping apart my work than actually knitting something! What I will ask is for a beginner, who has never ever knitted a day in her life, what type of knitting needles should someone like me start off with? I have a 14 inch size 15 needles…… we’re not getting along 🙁 In addition, I’m having problems trying to hold these needles. Please make a video on several ways to hold knitting needles. Maybe the US 15 needles are a bit too bulky for you. You can try a 5mm or 6mm. They’re not so small that you have to grip them hard and not so big that you feel clumsy holding them. I recommend starting with bamboo needles because they are less slippery than steel needles. They have more surface drag, so the stitches are less likely to fall off. Ways to hold knitting needles! That’s a thought! I’ll throw that on my list of tutorial ideas. Thanks! Hi there. Thanks so much for the videos. I’m having another problem. I am knitting a cowl on a round. I N10 and P10 and I’m noticing that the junction between that knit stitch and purl is getting loser and loser. I have increased the tension but it doesn’t seem to be helping. I’ve also started doing a reverse purl stitch as that makes the stitches tighter. But all in all the problem is continuing. Any suggestions? Hey Pamela, is the gap occurring at the cast on edge only? If so, you can easily close up that gap by weaving in the tail end of your yarn from the longtail cast on and closing up the gap that way. If the gap is travelling up your knitting at the join, then the problem could be your stitch marker. Is it quite wide? I find that a big stitch marker can unintentionally widen that gap. You can try to use just a piece of string tied in a loop as a stitch marker and see if that doesn’t help. The other option is to upload a photo of your work so that I can see exactly what’s going on! HELP! I am knitting a scarf, alternately lacy for 10 rows, then garter stitch for 10 rows, starred with 5 rows of garter stitch and the sides are developing a slant. What causes this and how can I correct it other than blocking when I am finished. Thank you for your help. Hey LaNell! It really depends on your pattern! Some lace patterns have a bias, meaning that they will slant to the left or right if the decreases aren’t evened out. For instance, if the pattern only has right-leaning decreases, guess which side the lace will lean towards? Sometimes this is the design of the pattern and sometimes it’s a matter of adding in a right or left-leaning decrease so that you have an even number of both right and left decrease. I would try to contact the pattern writer first as she or he can probably give you the best insight! So I have increased (accidentally) by 8 stitches can I just do a decrease to get the extra ones off? I have knitted 5 rows of 77 stitches and I am NOT starting over. I don’t see any holes but I think my thread split so it looked like I had dropped a stitch (it was hanging on by a thread of the yarn) so I grabbed it up and knitted that sucker. I am thinking decrease two on each end. I’m doing my first hat! Hey Maria, First hat! Good job! As for your increased stitches… to be honest, I would personally just rip out the work and redo it since you’re only 5 rows in. I know it feels like a lot since you’ve got 77 stitches, but to increase by 8 stitches means that you’ve increased over 10% of your total number of cast on stitches! If you really don’t want to redo, you can decrease those extra stitches away so that you’re back to 77 stitches. For instance, you can do 8 k2togs evenly across a row. Just beware that doing this may cause some puckering. Hope this helps, and good luck with your hat! So I’m knitting my second project, a simple scarf… And I started with 22 stitches, I’m up to 29! Lol it’s not completely obvious (to me at least) and have no clue where they came from! Do you count your stitches every row? As for whether I count my stitches every row, I don’t do that unless there’s an increase row or a decrease row in my pattern at which point the pattern will tell you the new number of stitches you should have. I’d suggest that you keep an eye on your rows as you knit them to make sure you’re not accidentally slipping in a new stitch here or there. It’s a pretty common mistake for new knitters to bring their yarn up front as if to purl, and then knit into the next stitch. That accidental yarn up front ends up turning into a new stitch (and also a hole! ), and that’s how new stitches end up popping up in your work. Thank you very much for your simple videos. I’m a total beginner and found you while searching for info about picking up extra stitches. I’ve realised now that I’m actually picking up stitches when I swap between a knit row and a purl row by putting the yarn in the wrong position when I start. This gives me an extra loop to work with so I pick up a new stitch every other line (I managed an extra 4 before I realised). I’m guessing there is nothing I can do about it now that I have moved on but advice would be good. I’m not too bothered about what I’ve done so far as I’m just practicing and not actually making anything properly yet. It’s good that you realised where the problem starts. I’m assuming that you bring your yarn to the front of your needle as if to purl when you actually plan of knitting. When you knit into the next stitch, you create a new stitch from that strand of yarn (aka. a “yarn over”). Is that right? This is a very common mistake for new knitters. There’s no real hack for this beyond remembering to bring your yarn to the back of your work when you start knitting. You can always double check at the end of each row to make sure that you haven’t added new stitches. Counting is one option. You can also spread out your stitches on your needle and look for that added yarn over. It looks literally like a strand of yarn draped over the needle at an angle. It looks different from your normal stitches, which normally sit “straight” on the needle. Beyond this, it takes a bit of old fashioned practice! I find that once your hand gets the hang of a knit stitch and a purl stitch, it will naturally bring the yarn up front for a purl and to the back for a knit. It’s muscle memory. I hope this helps! Good luck, Liz! I usually have the opposite problem to tight stitches. My knitting is very loose and my patterns come up much too big. If I try knitting tighter, then I have the tight stitch problem and can’t get the wool off the needle without spiking my fingers with the needle tips. I’ve been trying to knit a super chunky cardigan, but can’t go down a size as I’m already the smallest. I’ve found the video on picking up dropped stitches very useful, I have always had to undo my work and start again. You have saved my life! I was so close to giving up. Thank you. These videos were the most direct, simple (and adorably humerous) that I’ve found on the web. I’m decent at basic crochet and recently learned to knit via the Internet. It’s been so frustrating. Thanks so much for your help! I shall knit to see another day. ? Aww, thanks! I’m so glad they helped you out. If there’s another knitting problem that you need help with, let me know! I’m always on the look out for good tutorial subjects! I love your site, it is so simple and easy to use. I am knitting leg warmers and cast off the first one. I forgot how many stitches I cast on. Now I don’t know how many to do for the next one! Hey Amber, I would suggest counting up the stitches from the cast on edge. If you worked a ribbing like a 1×1 or a 2×2 ribbing, then you can count them up easily. A v-shape stitch is a knit stitch and a U-shaped stitch is purl stitch. A 1×1 ribbing means you’ll have an even number of stitches. A 2×2 ribbing means you’ll have a multiple of 4 as your cast on stitches. Does that help? Thanks! That does help, the way that I started to count, I was off 10 stitches. It would have been too long. You are the best. I hope it doesn’t take me a year to do the second leg warmer. You’re very welcome! Glad it helped! I just started knitting and I’m on my second practice swatch. After casting on and knitting my first row of stitches, I can’t help but notice that the length of yarn between my two needles slowly gets longer. This didn’t happen on my first attempt and I can’t seem to find the source of error. I’m not sure I can picture what you mean by the length of yarn between your two needles getting longer? Do you mean that the yarn between your stitches is quite loose? Is this happening on your second row. If you used a backward loop cast on (also called the “easy cast on” in one of the How to Knit videos), then that’s pretty normal. This cast on will result in a looser first row and subsequent second row. If you continue knitting, the stitches will even themselves out. You can always upload a photo of your knitting in the comments if I’m not diagnosing this properly! I’m using a set of 10 MM plastic needles, with 100% acrylic yarn. I casted the yarn as your video instructed. I could go on to the second step. But I get increasing yarn between the needles! And I can’t seem to knit the last loop (the one with the slipknot) properly. Please help! Hey Paige! If you’re adding new stitches, it could be because you’re making yarn overs by accident. I cover this rookie mistake in the second video. Basically, a lot of new knitters will accidentally bring their working yarn in front of the needle, as if to purl, and then knit into the next stitch. This yarn strand then forms a new stitch. 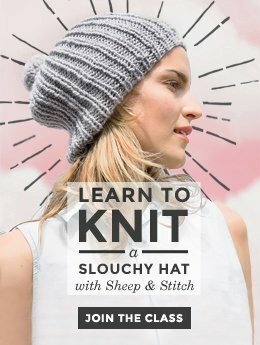 As for not being able to knit into the last loop (the slip knot), is it because it’s slipping around and off your needle? If so, you can try to keep it in place with your left hand by using your finger to press down on the stitch while you insert your needle into it in order to knit it. Hope that helps! Hi, i’m just working on the beginner big cozy scarf from your video and i’ve been noticing the end stitches are a lot bigger loops than the rest, they kinda stick out more than i’d like and i can’t tell if that’s just how it’s supposed to be or if i messed up along the way! Any advice? Hey Andrea! Do you mean the stitches where you cast on are bigger loops? Or do you mean that the stitches on each side of your scarf? If you mean that the stitches on each side of your scarf are loose, are you slipping the first stitch of each row? This creates a neat, tight edge, so if you’re not doing that, give that a try. Alternatively, some people find that they like garter stitch without slipping the first stitch, so you can try that as well. Lastly, it could just be a matter of tension! This means that you can give your yarn a little tug at the beginning of each row to make sure that the yarn isn’t loose and slack when you knit into your first stitch. Hope that helps! I’m a new knitter. I’ve viewed your video about fixing extra stitches HOWEVER, my extra stitch mess is not resolved using the technique described in the video. I can’t find the extra stitch (all the stitches appear to be legit stitches). Additionally, I tried just dropping off the first stitch…didn’t work. After knitting a new row with the first stitch dropped, I’ve created a weird big loop on the side of my “scarf” :-)….Now what? So the next row, I picked up the “loop”….urrrghhhh it’s just becoming a bigger mess…can you help? First, the extra stitches. If you have more stitches than you started out with, then you have added extra stitches. Your stitches may all look legit (as in there might not be holes), but if there are more stitches than the number you cast on, then somehow, those stitches have been added in. Now about dropping off the first stitch. Doing this doesn’t really help your problem of adding extra stitches. If you add an extra stitch, you can’t make up for it by dropping a stitch. This just results in a dropped stitch, which will create a big hole in your work that will ripple down your knitting. I’m not sure where you got the idea of dropping your first stitch. Maybe you’ve confused it with the concept of SLIPPING the first stitch? Knitters will slip the first stitch of their row in order to create a neat edge, but they don’t DROP the first stitch. Doing so, will result in a dropped stitch, which looks like a big loop (a stitch, essentially) that will just hang out on the side of your knitting and eventually unravel down. You mention that you’re a new knitter, so maybe this explanation is just more confusing and frustrating for you. What I would suggest is to rip out your work, painful as it is, and just start over. Get comfortable with knitting to a point where you’re not adding in or dropping stitches. This can be your practice knit. Take as long as you need. The practice knit doesn’t need to BE anything. It’s just a practice, so no pressure. Once you feel confident with your practice knit, then you can either unravel it or cast off and keep it as a token, and THEN you can officially start your scarf. In my opinion, the best way to not add new stitches is to practice knitting. Accidentally adding and dropping stitches is a classic beginner mistake, so the more you practice knitting, the less likely you are to make them. Hope this helps, and good luck! How does one start off with a nice tight (but not too tight, a just right tight) stitch and go to being so loose? It’s driving me insane! I’ve looked and looked for a problem, did I miss a stitch or add another but alas I am left stumped. Wish there was an option to show pictures. Please help! Hey Nelle! You can upload an image in the comment section here. Just underneath the “Comment” box there’s another button that allows you to add an image with your comment. Just choose an image from your computer to upload. Hi Davina! 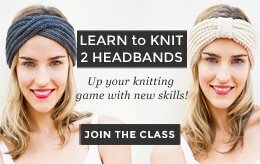 I just started knitting a week ago and thank you so much for your super informative videos. I have totally made all three mistakes while knitting the simple garter stitch scarf. I also noticed that my piece is curling at the edges. How do I prevent this from happening on my next piece? I’m using circular needles (10.5 cm) and bulky yarn. Is it due to I am tight knitting? Hey Katrina! Curling, eh? Hm, that’s a bit unusual since garter stitch doesn’t typically curl inwards the way stockinette stitch does. It could be that you’re knitting tightly or that your needles are too small to accommodate your yarn, resulting in a tight fabric. If your scarf continues to curl after you’ve finished it, you can consider blocking it. Blocking involves dunking your scarf in room temperature water, letting it soak for about 10 minutes, pushing out all the water (not wringing it), and then laying your scarf out to dry on some towels. You can use sewing pins to pin down the edge of your scarf that’s curling. Your scarf will dry in the shape that it is laid out. It will also help to relax the yarn fibers, so if your knitting is very tight, blocking will help release some of that tension. Hope this helps! I am new to knitting and having trouble keeping my first row tight. Once I cast on my stitches and then turn my work. That first row is loose. Now matter how tight I try and hold the yarn it still has bigger loops and it’s only this row. Please help! also just learning. next step will be in the round knit one pearl one. anyway to the point. Hey Dan! Great question! When you rip back your work and you have a bunch of “live” stitches that need to be picked up, you should pick them up so that they’re not twisted. This will ensure that your stitches are facing the right way. I made a video on this that you can check out here: https://youtu.be/d6MIfcxTIv8 Hope that helps! Today I tried staring the scarf that’s you made in a video with merino yarn, I couldn’t get passed the first row of stitches, I kept having a lot of slack when I would finish. Each stitch it would just grow in size. Any advice? Hey Esteban! Hmm. That’s unusual. Could you upload a photo of your knitting? You can do that in the comment section underneath the text box. Just click “Choose File” and select a photo from your computer. I still cant get it. I sort of got it once, and the next row did the same thing. The loop in the picture, it’s just extra slack that I don’t know how to get rid of. I have the same problem that Esteban had! How do I get rid of the loop from the last cast on stitch?? And I have tried, again and again, still from the second row on the stitches just become real tight, like you said I need to pull muscles to get through them, I tried to be loose but then I holes in those stitches as well because it’s not “fastened”, and I try to keep those stitches on the fat part of the working stick, but the yarn just doesn’t seem long enough to keep it that low, it’s difficult not to end up knitting with the tips of the sticks… Please help me Davina! !